Many people don’t know this, but you can even grow plants and flowers only in water, you don’t need soil every time. The difference is in the procedure not in the result which is the same. 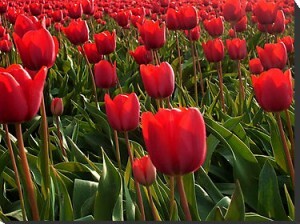 For example, the tulip can grow very beautiful only in water. You don’t have to get dirty by working with soil inside your house and so on. You can place them in water and decorate the entire house with tulips. The steps needed in growing tulips in water are very simple. 1. Place a few marbles inside a clean vase until a third of the jar is filled. Their purpose is to allow you to use lesser water in the process and to allow the roots of the tulip to anchor on them. 2. 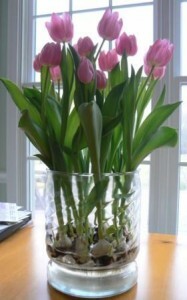 Now place the tulip bulb facing upwards inside the vase until it gets stuck inside. 3. 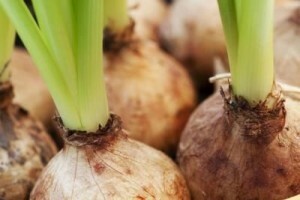 Now start pouring clean water through the tulip bulb until you fill in half an inch below the bulb. It is very important that the bulb doesn’t touch the water. Very important! 4. Now leave the vase in a dark and cool environment to let it grow. You should have to wait around 16 weeks. You will have to change the water regularly. Always keep the water at the same level. 5. When the 16 weeks are passed you can bring the vase at sunlight. After that it should take another month until the bulb blooms. Don’t forget to change the water regularly. Professionals explain how the appropriate climate is very important to assure the growth of tulips inside water. For this you might need refrigeration and also sunlight immediately after 16 weeks. If you live in areas with prolonged winter then this might not work. This is why it is important to set up the growing process so that after the 16 week outside is a beautiful sunny summer.